Trapper Ron is a local wildlife nuisance animal control operator serving the Farmington Hills and surrounding cities with solutions to animal control issues. We will be publishing this newsletter on a monthly basis, if you find this information useful please signup to receive regular updates and animal control stories. Spring is almost here and already some animals have come out of hibernation. The trapping business in general becomes very slow during the winter months. Early to mid-March shows a slow but steady increase in varmint sightings, skunk smells and calls for the removal of the nuisance animals. I will spend a lot of time over the coming months trapping and relocating nuisance animals, such as raccoons, opossum, skunks, rats, mice and Coyotes from property in the Farmington/Farmington Hills and surrounding areas. Many people ask, what do I do with the animals I live trap, such as skunks. My standard, favorite, answer is “Well, I let them go”, they always ask where do I release them, I respond, “At my next client, of course”. It usually takes about 5 to 10 seconds for it to register that I am kidding with them. Releasing animals is not rocket science; however, how I deal with a trapped skunk is a trade secret. I do not want to be responsible for a novice to accidentally get a special gift from their new striped friend. In reality, I must follow the guidelines outlined by the Michigan Department of Natural Resources. The license that was issued to me, and my competitors, is very specific in dealing with animals caught in live traps. Most animals can be released in a habitat that is conducive to their well-being. Unfortunately, some animals need to be destroyed, such as rabid, injured, or animals that otherwise will cause harm to themselves or there surroundings. Remember, animals are among us and for the most part they just want to live quietly and will remain unseen. With our expansion into animal habitats, our encounters will only increase. Removal should be considered when animals become a danger to humans or property. Apartment complex residents are usually the first to experience nuisance animal problems in the spring. The mere numbers of dumpsters in a large complex are a smorgasbord of fresh delicacies. Raccoons, Opossum, and Skunks are the main culprits that tend to startle residents as they dispose of their refuge. Imagine yourself taking the garbage out early in the morning before you go to work. It’s still dark out as you walk to your dumpster across the parking area. You have done this chore a thousand times since you moved in with nothing to fear except the cold morning air. You approach the dumpster and lift the lid; it slams loudly metal against metal. Suddenly, one, two, or more raccoons jump out, or worse yet, you startled a skunk or two. I don’t care how brave you are; the surprise of this would rattle the nerves of anyone, including Trapper Ron. Calls from homeowners, urban and rural, follow the apartment complexes. Skunks hibernate in January and February, usually for two coldest months of the year. You may have already noticed the smell of skunks in your area; they are looking for food and a cozy place to sleep during the daytime hours. Low-lying decks, preferably those with dryer vents exhausting warm air, are the preferred locations for bedding around homes. Skunks primarily eat grubs, insects, and worms when the ground is loose enough for them to dig. When the ground is frozen they will eat anything, including irresistible tidbits in garbage cans or dumpsters. For those who are brave enough to capture a skunk on their own, live traps can be purchased at your local hardware store (or rent one from WWW.TRAPPERRON.COM). Bait it accordingly, and wait for your skunk to be trapped. It may take a couple of days, and you may catch other animals in the process. Eventually you will trap the skunk or skunks in your area. I can tell you there is no greater feeling when you trap the animal that has caused your nose to turn. The problem comes after the animal is trapped--now what. I recently received a call from a local women who decided to live trap a skunk that was on her property. The good news is she caught the pesky critter, the bad news is she didn’t know how to transport or how release the varmint. She was very concerned about getting sprayed and didn’t want to put it in her car. She had called several of my well-known competitors for assistance and their fees were out of line with her budget. She was very concerned about the cost of removing the animal and I tried to accommodate her. As you all know by now, I will gladly assist anyone in need, when possible. As a compromise, I traded removing the skunk in lieu of her live trap. In the end, everyone was happy, she got rid of the varmint and I got a new cage. Having Problems With Animals in your Attic And Want To Try It YourSelf. Save Your Money & Try Our Coyote Urine. What Should You Do When There Are Raccoon Babies In Your Chimney ? Chimney Flue Caps will stop un-wanted visitors from taking up residence in your chimneys. Fortunately, most people do not use their chimney during the breeding season of most mammals. In 4-8 weeks the babies will eventually be moved to another site. Waiting it out is the easiest solution. Using harassment techniques (noise) may speed up the eventual move, but the risk of abandonment exists. Once the babies are gone, CAP the chimney. As the saying goes "You can pay a little now or pay alot later !" Chimney Flue Cap Service Includes Flue Inspection, Chimney Flue Cap, (Shown in Website WWW.TRAPPERRON.COM), and Installation. $110.00 For the First Flue Cap Installation. $35.00 For Each Additional Flue Cap. Our Vent Cover Services includes Vent Inspection, Bird Guard, Removal of Birds/Nesting Materials and Installation. $65.00 For the First 3 Vent Cover Installations. $25.00 For Each Additional Vent Cover. Why Wait - Schedule An Appointment To Install A Chimney Cap & Bird Guards Today ! 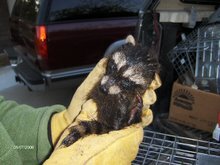 Subscribe at http://www.trapperron.blogspot.com/ and receive by weekly tips for dealing with animal control issues. If you like these tips, please pass them on to your friends, clients and colleagues. website at http://www.trapperron.blogspot.com, you are a client or you told me you want to subscribe. PRIVACY STATEMENT: Trapperron.com® respects your privacy and has a strict anti-spam policy.